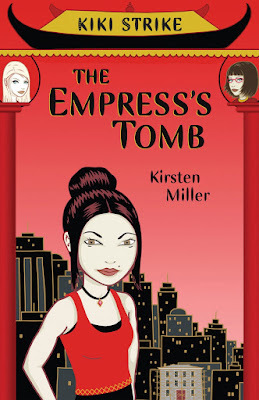 It won't be in bookstores until the middle of September, but since it's already up on Amazon (wow, they're fast) and was recently discovered by a very enterprising girl detective, I thought I'd go ahead and post the cover of The Empress's Tomb, along with a brief description of the book. . . Strange things are happening in Kiki Strike’s New York. Giant squirrels are running rampant. A hungry ghost haunts an opulent mansion. And two deadly secrets are about to come to light. Once again, it’s up to the Irregulars to protect the city—and save themselves. But this time, the six delinquent girl-geniuses have more on their minds. Ananka may be exiled to a remote boarding school; Kiki’s life is in danger (as always); Betty seems to have found love in all the wrong places; and Oona….well, Oona’s in the most serious trouble of all. From Chinatown to Fifth Avenue, whether they’re exploring a forgotten world deep beneath Manhattan or resuscitating an ancient Empress at the Metropolitan Museum of Art, the Irregulars have a knack for finding trouble, and putting it out of its misery. Wow! I can't wait to read it. If only it came out sooner... Oh well, I can wait. I'm just glad your writing another book. I really like the cover as well. I just wish that Kiki and Annika's heads were bigger. yea!! i'm so excited, i just finished pre-ordering it!!! it looks like such a great book, i can hardly wait! i love the red too, it's probably my second fav colour after black. I just finished your first book and I absolutly loved it!!! I didn't know there would be a second book, but I am really glad there is!!! Thank so much, it sounds really good!!! Sounds great!!! Can't wait until it comes out!!! OMG!!! i absloutely cant wait!!! I CAN NOT WAIT TO READ IT!!!!! ARE YOU GOING TO WRITE A THIRD ONE? SWEET! I CANT WAIT! Do you know how long the series will be? or if it even is going to be a series. AAHHHHHHHHHHH!! the anticipation is killing me!